Hey, where’s the doll I put my equipment on? What kind of second rate Diablo clone is this? 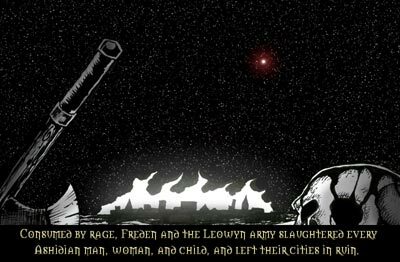 Morning’s Wrath is an RGP put out by Ethereal Darkness Interactive, a tiny independent game studio, which I am willing to bet is less of a company and more of a dedicated group of friends who collectively thought, “What the hell, lets do it” and made a videogame. Let me make it clear off the bat; making a video game is HARD. Anyone who has managed to do it deserves a tremendous amount of respect, especially when they don’t have the resources like other mega-gaming studios have. Even if they have the resources, making a good video is still hard, as EA demonstrates every single day. After that all too easy dig against EA, I have to say this: Morning’s Wrath is just another mediocre videogame that should have come out a couple of years ago. It’s not particularly bad, but the whole thing just seems played out. You are princess Morning who hasn’t really done much her whole life and suddenly finds out that she is the last hope for her besieged kingdom. Oh, and I forgot to say that your enemies are powered by evil magics, there is a secret mana spring behind a secret wall, and a zombie-filled ancient kingdom that desperately needs Morning’s (and only Morning’s) help underneath the castle, too. While the story line is not particularly revolutionary for an RPG, there is an interesting wrinkle that I don’t think the makers really intended: Morning’s kingdom kind of went on a genocidal rampage against their neighbors the Ashidens, who are the “evil” invaders that storm the castle. And not like the, ho hum I kind of killed a few people sorry, kind of genocide either. It was more like, “We killed every single man, woman, and child and liked it because they were just naturally bad and didn’t deserve to breath the same air as us,” kind of genocide. Sieg Hail to Morning, everybody. But I digress. The graphics are pretty good, about Ultima Online quality. I have never had a real need for super graphics, and these are good enough. The music, once again, is pretty good. More importantly, the music is not bad, which can often be the bane of an otherwise good (or in this case, ok) RPG. The camera stays in one stationary position the entire game, looking from above a la Diablo. If you don’t download the patch, navigating near walls is tough because they don’t become transparent enough to see very well. Speaking of the patch, DOWNLOAD THE PATCH. Without it, the game has a tendency to crash, which is incredibly annoying if you don’t save every two minuets. If I have to watch the all-too-slow beginning slideshow “here is the back story” presentation again…well, I wouldn’t do all that much but would be pretty pissed. It is the game play that really brings Morning’s Wrath down. In another nod to Diablo, Morning’s Wrath operates under the “point and click” attacking system. However, in a distinctively non-Diablo angry fist shake, pointing and clicking has a high rate of failure. I would often find myself running into a crowd of angry zombies only to be unable to click on them when I got there. I learned quickly that saving early and often is a good strategy for Morning’s Wrath, at least until one gets used the jittery controls. The inventory screen is bland but functional and the hot-key inventory works really well, which is a good thing because I often needed a quick potion to keep me alive. Areas in Morning’s Wrath are divided into “places where you can go” and “places where you will die instantly.” At any given time, an innocent move to the left will catch the eye of an enemy who is about a bazillion times stronger than any of the baddies you have been fighting, and Morning’s death is all but assured. The game goes the brave route of not having low-level areas but rather low-level paths surrounded by instant death. Frequent saving cannot be stressed enough. 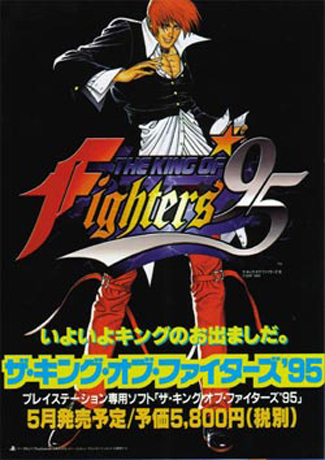 The fighting system is frustrating, but the magical system is innovative and cool. Spells are not bestowed upon you as your level grows, nor does a skill tree not lock them in. As the game progresses, Morning collects various stones that have different attributes. With various spell ingredients, such as fire or lighting, shot or explosion, you can make some pretty cool spells that work very well. You need at least two parts to make any spell but can’t have more than 12. The more complicated a spell is, the more mana it takes to cast it. I feel as if the rest of the game design were more like the magic system, then we would have a high quality RPG on our hands. To weakly copy things from good mainstream games doesn’t exactly get the blood pumping. All in all, Morning’s Wrath is an ok game that shows potential but has some flaws that can get in the way of the designer’s hard work. It is not that expensive, and is a decent time for RPG fans. Once you get past the first couple of levels, the game gets easier to play and is pretty fun, especially as you try to make the most devastating spell possible. Have a little patience and give it a shot, if only for the fact that it’s an independent game that tries some new things (just not enough). 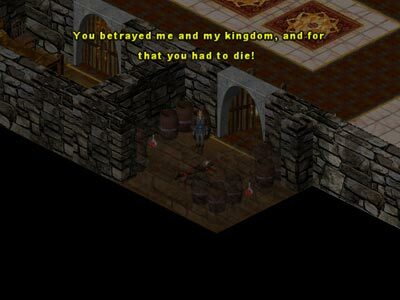 I hope Ethereal Darkness Interactive stays around for a while, I would like to seem them move from “Ultima Diablo Online: the kind of lame edition” to something a little more original. I guess we won’t be getting any more free games after this review. Thanks a lot, Dan. Wait, the game is free? As in you guys got a free copy, or free for the average joe videolamer? We’s got hooked up because we run this here professional gaming site. hehe no really, thanks a lot for reviewing our game, your points are definetly valid, and most of them are because it was our first game and we were learning.